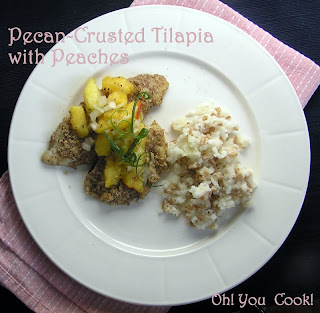 Pecan-Crusted Tilapia with Peaches - and a Giveaway! Today's delicious recipe is a riff on a recipe from Whitney's blog jewhungry. Whitney is a middle school counselor and new mom in Florida. I am a public librarian and old mom in New Jersey. So aside from being Jewish mothers and carbon life units, what else do we have in common? FOOD! And blogging about food. What also ties us together is the Kosher Connection Great Blog Swap, where instead of the usual "we make and blog about whatever enters our pretty little heads," the Head Hopper selected a blog for each of us from which we would make and blog about a recipe from said blog. Sorta like a kosher version of the Secret Recipe Club, but without the possibilities of treif cooties. After going eenie-meenie-minie-moe careful consideration, I selected Whitney's Sister-in-law's delish fish recipes, Pecan-Crusted Trout with Peaches. 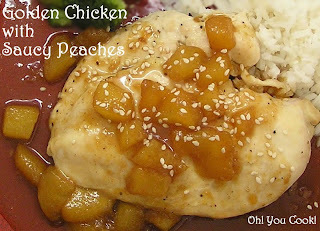 Peaches are still plentiful so I made up this peachy sauce to serve with chicken. Everyone who wasn't a peach-lover loved it! Oriental five-spice powder is a combination of oriental spices, the exact recipe depending upon what brand you buy (or what recipe you follow if you make it from scratch). The only constant is star anise, so named because it resembles a star, and anise, because the taste resembles licorice. I don't normally care for anise (or licorice), but it really works here so I'd recommend picking some up at the local Chinese grocery or a larger supermarket. Fresh peaches are preferred, but if you are lazy fresh peaches are unavailable, substitute with a 16 or so ounce can of sliced peaches, drained. The result will be diner food ... good but not swoon-worthy.